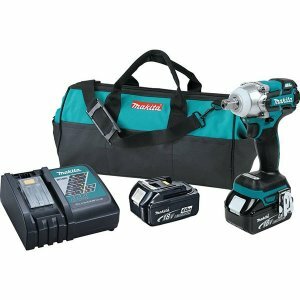 Utilizing Makita’s BL Brushless Motor Technology and their Star Protection Computer Control, a system that uses real-time communication between the battery and the tool, the tool is able to monitor conditions during use to protect against overloading, overdischarging and overheating. What this means is that you get longer runtimes and better performance out of every charge. The 3-Speed selector on the tool allows users to more easily control the amount of torque they are applying to specific tasks. This reduces the chance of over-torqueing fasteners that could break if pushed too far. Along with the speed selector is an onboard battery level fuel gauge and an LED task light with an independent on/off switch. Suggested retail price for the kit which includes 2 4.0Ah batteries, a rapid charger and a contractor is $369. A Tool-only option will also be available for a suggested price of $189.